Toledo district's premier riverside resort offers easy access to natural & cultural treasures and many activities including birding, jungle trekking, caving, river kayaking, snorkelling and manatee watching on the offshore cays. The maximum rating score we can award in each section is 5, and the minimum 1. When a criterion is fully met in our view we award 5 suns, when it is nearly met 4 suns, when it is partly met 3 suns, when it is not at all met but effort is being made to meet it 2 suns and when we feel that it is not at all met and no effort is being made to meet the specific criterion, 1 sun and when we feel that the the specific criterion is being directly violated by the operation 0 suns. You may add a comment with improvement suggestions to the Lodge at the bottom of the page. For detailed information on the free ECOCLUB.com Rating System please see here. The official legal entity is Future Perfect Ltd. With two directors, Robert and Marta Hirons. The business was formed before we had built the lodge and decided on a name. 1b. Who is/are the legal manager(s) of the Lodge? 1c. Since when has the facility been under the current ownership & management? 1d. If owned by a family, since when has the family been residing in the area, and for how many months each year? The family owners have lived in the area since October 2001 and reside here for twelve months of the year. They have no other property assets. There are so many areas in which decisions are made so this will not be comprehensive. They are small or large, urgent or important and the context often determines who will make the decision and how. Financial decisions: Many staff are involved in making a list of improvements and repairs to be made. The facilities manager will produce an estimated bill of quantities for each job. Rob and Marta Hirons will decide the order of priorities in which the jobs are to be implemented depending upon available resources. When guests arrive unexpectedly the assistant manager has the discretion and authority to negotiate room price within defined limits. Marketing Decisions: Most of these decisions are made by Rob Hirons based on knowledge of the market and the most fruitful areas for investment of money or time. Staffing decisions: Recruitment and selection decisions are made after interview by Rob & Marta Hirons. Training and professional development decisions are made by them on the basis of available formal training opportunities and their ability to set up informal staff exchanges. Guest Tours: The tours are aimed to provide visitor enjoyment in a safe environment. Depending upon the weather and conditions decisions on whether a tour is to go ahead will be made by the tour guide with guest safety as the prime consideration. Restaurant: On a day to day basis the kitchen can be managed by the Assistant Manager and the cook who together can prepare the menu, prepare purchasing lists and deal with any issues arising during dinner service. 1f. Who has access to the Lodge's facilities and its land and for what uses? The lodge is open to the general public as well as to overnight guests to enjoy the facilities as a tourism and recreational asset. 1g. Who took the initiative to build this Lodge? 1h. How did the (nearest) local community participate in the decision-making process concerning the founding and creation of this Lodge and how does it participate in its running? It did not. It does not. The lodge was built on privately owned land purchased by ourselves. The lodge created work for people from the village during the construction phase and has created jobs for our staff who live in the village for the past 8.5 years. When we opened there was some discussion at a village meeting about requiring us to employ lots of people on a two-week rotational cycle although they never brought this proposal to us and the idea that we should allow the village to become our Personnel Manager is risible especially when we have set out to train and develop skilled staff who can successfully manage guest services and a restaurant. 1i. Anything else you would like to mention in this section? Our vision, purpose and values can be found below. We are a family owned business established, like many other tourism businesses in Belize, by the investment of our life savings. We do not believe that the legal form of a business has much relevance as to whether it performs as a socially responsible corporate citizen. Nor do we believe that being local makes a business in any way intrinsically more ethical or better than one like our own that has been created from personal wealth invested from abroad but which makes us 100% committed to Belize. The local track record of communally owned enterprises or NGOs' efforts to create "sustainable livelihoods" is very poor and most job creation and poverty alleviation in our area has been achieved through inward investment. It is our aim to create a successful and sustainable tourism business that will provide an exemplar of good and ethical business practice, provide secure employment for our staff and their dependents and provide enhanced career opportunities for those staff who decide to move on. Our low staff turnover compared with tourism businesses on the coast and elsewhere in the country suggests that we are doing something right. To be recognized as providing the best customer service in the Belize tourism industry and to demonstrate that profitability and long-term business success come from a deep understanding of customer needs and the ability to exceed their expectations. To provide holidays of the highest quality which develop the individual's appreciation, understanding and knowledge of the reef and rainforest ecology and local history and culture of Belize. Joy in Work: We will make The Lodge at Big Falls a place where people look forward to coming to work. We further believe that any business can only succeed if the focus is first on customer satisfaction and that business processes are designed to deliver satisfaction as defined by the customer and not as defined by the local community or suppliers. The benefits to the local community accrue as the business develops. As the business develops it creates more employment; more guests mean more contributions to the local schools; more guests mean more paid visits to organic cocoa farmers and local craftspeople; local craftspeople sell more goods and local farmers sell more fresh produce. This is the essence of the virtuous circle that begins with successful customer-focused business and extends from there into the community. There are no examples down here of enterprises that have been designed to bring benefits to the local community and have created successful businesses as a result. There are numerous examples of enterprises that have been designed as communal or co-operative enterprises and have failed because the customer/guest got forgotten or was never really considered. Photo 1i1: The Lodge was awarded the 2009 Small Hotel of the Year Award in the Belize Tourism Board's 10th National Awards. The award, "recognizing excellence in service", was based on online nomination and voting by past guests, international travel companies and agents, local suppliers and travel industry partners, local customers of the lodge's services and other friends of the lodge. Photo 1i2: Carlos Chiac our gardener/landscaper decided to turn these two hibiscus bushes into an arch at the end of the walkway. He didn't ask. He just knew that he worked in an environment where his initiative was more likely to be applauded than criticised. We like it, by the way. Photo 1i3: Receiving the award at the Belize Tourism Board Awards Ceremony in Belize City, June 2010. L-R Rob Hirons lodge owner, Cordelia Choco lodge cook, Steven Choco lodge guide, Shakira Oxley Marketing Director BTB and Gach Guerrero member of the BTB Board. Steven and Cordelia enjoyed the event and stayed in a hotel ( The Radisson) for the first time in their lives. 2c. What is the total area of the land of the property? 2d. What is the total covered area of the Lodge including rooms and common areas (in sq. metres)? 2f. How many employees are there (excluding yourself and members of the family)? 2g. How many employees are from the (nearest) local village? 2h. If applicable, do employees or the community own any shares or share part of the revenue? 2i. What was the total turnover (total sales) in 2010? 2k. What were the total profits in 2010? 2l. How are profits distributed, and who decides about it? There has been no distribution of profits. Any profits have been re-invested in the business. 2m. Are there any national and local taxes to be paid or are you exempt? We pay all national taxes which include General Sales Tax on tours, meals, drinks and transport; Accommodation tax on room revenue; business tax on turnover and Social Security payments on behalf of all staff both part-time and full-time. We have no exemptions. Social security payments cover illness, maternity leave, injury benefits, medical care, disablement and retirement pensions. 2n. What was the total amount of taxes paid in 2010? 2o. What percentage of consumables are locally sourced, how many are nationally sourced, and how many are imported? A guesstimate only because we do not have time to record this type of information and there is no specification whether value, volume or any other possible measure is being asked for. Local: 20% mainly fruit and vegetables National: 80% We do not ourselves import any consumables but a large proportion of the national purchases will have been imported by one of our suppliers. That split would probably be National 30% Fruit, vegetables, dairy products, meat and paper products Imports 70% canned goods, wine and spirits, butter, cleaning products etc There is very little domestic industry so the proportion of manufactured items imported to Belize is very high. 2p. Do you cultivate food for the guests? No because that would mean we were competing with local providers. As a matter of policy when we first arrived we decided that we would work to develop products and services that were not already available locally to the quality standard we required. ie We would buy from farmers locally as much as possible. 2q. Do you have any agreements with local producers? No formal agreements but we talk and encourage them to develop supplies for the local tourism market as well as ourselves. We made an unsuccessful bid to the UNDP for a project that would have helped to establish a market for local fresh produce, crafts and finished wood product exports and helped poverty alleviation for many local subsistence farmers. No business or market was established by the successful bidders, a group of local consultants. 2r. Have ever you received any funding, state, national, private or international and for what purposes? 2s. What is the minimum (low season) double room rate (including breakfast) per room per night? USD 185.00 from November 2011. 2t. What is the maximum (high season) double room rate (including breakfast) per room per night? 2u. Anything else you would like to mention in this section? The greatest challenge in managing the business is the seasonality. We have a high season stretching from November to May and a low season where those profitable months are balanced by loss making periods. This is true throughout the country but exaggerated in the south because it is inland and the most recently developed destination. Beyond the seasonality, Belize has a very high cost of living which is comparable to European prices and more expensive than the USA. Photo 2u1: The lodge has created skilled work for women in the village. While often shy on first meeting they are quick to learn and have gained skills self-confidence and self-esteem from the experience and training received at the lodge. There were previously no employment opportunities for women in the village and they make a significant contribution to gross household income. Photo 2u2: Stalls in the local market offer a range of locally produced fruit, vegetables and "ground food" like cassava, coco yam, ginger, sweet potatoes, cho cho etc. 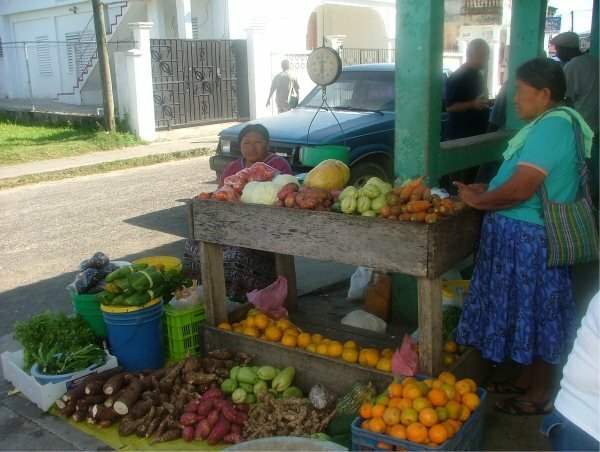 Other vegetables such as lettuce, celery and sweet peppers are either brought from Mennonite farms in the north of Belize or imported from Mexico. We decided to be one of the first tourism investors in the remote southern area of Belize that was not yet linked to the north by a paved road. The location is half a mile from the village of Big Falls where all our staff live and they can walk or cycle to work. The location seemed strategically placed 28kms before the main town of Punta Gorda on the coast and close to the junction of a dirt road that leads to the Guatemalan border. This road is now being paved so we may benefit from the extra traffic that this will generate in two or three years. We are near to the geographical centre of the district and closer to the Mayan villages, archaeological sites and other attractions than people based on the coast. More specifically we liked the way that the lodge property sits within a meander of the river and provided a natural fire break as well as some privacy. It also allows us to offer river tubing so that our guests can float around the meander for about 600m and finish just 100m from where they began. Many eco-lodges takes steps to reduce their energy usage after construction. We attempted to design in low energy usage from the very beginning and that decision influenced design and construction. This included using thatch for the first six cabanas and the main lodge. The high thatched roofs keep the rooms cool. We placed 2m x 1 m corner windows in the rooms to catch the breeze and also help in cooling. Overhead fans use 15w at their lowest speed and 80w at their maximum speed. We thatched the verandahs so that these could be used as part of the outdoor living space. We placed water and electrical cables in the same trenches to reduce environmental disturbance and cost. We have replaced tungsten bulbs with long life low energy bulbs using those that produce the "warm" yellow tones of traditional bulbs. Unfortunately power fluctuations mean that these expensive bulbs do not have the long life promised by the manufacturer but we are sticking with them nonetheless. We use a combination of solar path lights and low voltage lights for pathways at night-time. We use kerosene lamps to create ambience in the lodge and as a back up should we experience a power cut during dinner service. Training for staff and information for guests includes ways in which to minimize waste of electricity. We have a small 9KVA diesel generator as a back up for the mains supply. The generator will allow use of fans, lights and water. We do not heat any space. Water in the guest cabanas is heated by energy efficient Paloma on-demand gas water heaters. The benefits of these heaters are that the water heated exactly matches the hot water consumed and it never runs out like a hot water storage tank. Most cooling is done naturally or by fans but we have 3 air-conditioners. The first is in the administration office and protects IT equipment and electronic records for the business. The other two are in our two new cabanas that were built with zinc roofs and benefit from A/C during the dry season when , despite roof insulation the rooms can require cooling since wood is such a warm material. Cleaning is done using no electrical energy and using newly available bio-degradable cleaning products. Laundry is line dried whenever possible in order to reduce energy use. Our tumble drier is gas powered and less energy hungry than the electric alternative. We purify water drawn from the Rio Grande river using Culligan water system units that include reverse osmosis and UV . Water is one resource in which we are well-endowed with 3.5 metres of rainfall in 2006 and an annual average of more than 2.5 metres. Nevertheless we use electric power to pump from the river and purify but have balanced the system so that with large pressure tanks the pump runs for just 50% of the time that water is being passed through the system. We have information in our rooms for guests and in the kitchen and laundry for staff to help them minimize waste. We use bottled gas for cooking. We re-use plastic water bottles refilling with our own clean water. We offer vegetarian and vegan cuisine on request and use as many local fruit and vegetables as possible and are including more local recipes prepared by our Mayan staff. We have three methods. Vegetable waste is composted and used in our gardens. Other organic waste is buried in a pit on the edge of our site away from guests and water sources. Metal, glass and plastics are transported to the local municipal dump 12 miles/19 kms away. The nearest recycling facilities are about 150 miles away so the small quantities of waste generated and energy used to transport waste there do not make the use of that recycling facility viable. We collected and used crushed cans instead of steel rebars in building a weather proof concrete walkway from the car park to the lodge. The main pest we have to deal with is termites which after rains may attack the thatched roofs of the cabanas or the wooden verandahs. The most effective way to deal with them is by finding and physically removing the nests from trees and drowning the occupants. If they get into the thatch we have yet to find an alternative to malathion. Leaf cutter ant nests are removed by digging and finding the queen. Faced with a choice between connecting the lodge to the grid or generating our own electricity with a diesel generator as the main power supply we decided on the national grid. A diesel generator would have been dirty, noisy and polluting on 10.1 hectares. We have a small 9KVA diesel generator as a back up for the mains supply. The generator will allow use of fans, lights, kitchen appliances and water. We do not generate any noise that would bother our neighbours. Our neighbours can be noisy but there is not much we can do about that. Local cultural norms do not seem to recognize noise pollution as an issue. 3m. Name, population and distance of nearest settlement (in km or miles)? Big Falls village, population 1000, 800 m from the lodge. We have buses passing along the main road 800 metres from the Lodge entrance. 3o. Is the nearest settlement accessible by public transport (such as bus, train, boat)? If yes, please provide instructions from nearest International airport, or nearest major city. The main lodge and original six cabanas all have an octagonal design which is basically a rectangle with the corners cut off. Some corners are oriented towards the prevailing winds so that they catch as much of the available breeze as possible and provide natural ventilation. The high thatched ceilings and the thatch itself allow heat to escape upwards maintaining a comfortable ambient temperature for at least eleven months of the year. The fans are intended for use in warehouses and therefore work very efficiently and provide adequate cooling during the dry season from March to the end of May. The verandahs were conceived as an extension of the indoor living space and each have two hammocks. The ends of the verandahs go part way around the cabanas to allow birdwatchers a 270 view from their verandahs. While there is glass in al the front doors f the lodge and cabanas the windows have no glass but only screens with wooden louvers. 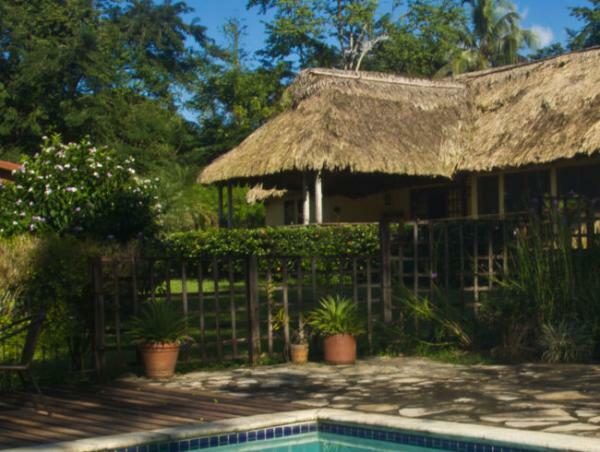 6 cabanas and the main lodge with kitchen, bar and restaurant are made from concrete blocks with bay leaf palm thatch. The two new cabanas are made from secondary hardwoods ie We have used no mahogany, tropical cedar or rosewood in their construction. While the roofs of these two are insulated the wood construction does mean that more cooling is required at certain times of the year than can be provided by simple ceiling fans. The greater part of the property has been left untouched. When we arrived in October 2001 the property had been devastated by Hurricane Iris that had passed through ten days before our arrival. We spent several months clearing up fallen trees after that storm. The property had also previously been farmed using traditional slash and burn methods that are particularly destructive on the environment. So we left the property to recover for a number of years. We used the previous owner's pastures to build so had no need to remove any remaining trees. Since then we have planted and landscaped those open areas trying as far as possible to use Belizean species and avoid plants exotic to the country unless they had been here for many years eg bougainvillea, bread fruit and other species that were imported more than a hundred years ago. Our own plantings are labelled using metal place holders and laminated labels. Finding a labelling method that is durable is particularly challenging in our humid climate. 3t: Do you organise or promote tours involving hunting or sport-fishing? We do no hunting. A small minority (<3%) of our guests want to fish on some of their days here and they follow the local policies of catch and return in the Port Honduras Marine Reserve accompanied by local fishing guides. Being 28 kilometres inland fishing is not something we market and all fishing is on request only. The chart below (Photo 3u) records the monthly electricity consumption taken from electricity bills. During the Financial year May 2010 to April 2011 the total annual consumption was 22,104 kilowatt hours. During the same period the number of guest nights was 839. Dividing kw hours by the number of guests nights gives a consumption per guests of 26.35kwh. The corresponding figure for the previous year was 32.95kWh per guest night. this does not necessarily mean that we operated more efficiently in 2010-11 but rather reflects the fact that the total energy used includes a "fixed" amount that does not depend on the occupancy rate (i.e. the energy used to light and heat common areas, run refrigerators and deep freezer, power the pool etc. ), and a variable amount that depends on the number of guests present (washing dirty towels and sheets, hot water usage, room lighting and fans etc.) the fixed cost energy use represents a large proportion of the total so that the higher figure for 2009-10 is higher because the guest nights were lower as a result of the economic downturn in north America affecting reservations. There are two electricity metres at the lodge. The house metre is included because it monitors laundry use and the pump that brings water from the river and pushes it to the rest of the facilities. This figure for energy usage doers not take account of thermal energy used with LPG gas for water heaters and the laundry. 3v. Anything else you would like to mention in this section? This Paloma tankless water heater serves two rooms. Tankless water heaters heat on demand only when hot water is needed. Since there is no hot water storage, thermal heat loss is almost completely eliminated. They never run out of hot water and can run as long as water is required you can set the water temperature to a much more reasonable and safer temperature, closer to the actual temperature you will use the water at, reducing risk of scalding. According to the US. Department of Energy, for each 10°F reduction in water temperature, you can save between 3%-5% in energy costs Since hot water is not stored, tankless water heaters generally handle hard water minerals and sediments better than conventional tanks. This makes them far less likely to leak or rupture and able to maintain efficiency throughout their life. They are small so if located inside they can save floor space. Photos3v2 & 3v3: Signs in the guest bathrooms talk about the efficient use of electricity and water and explain our policy in relation to changing bed linens and washing towels. 4a. Do you provide health insurance and pension to your employees? Yes. This is covered by Belize's Social Security system into which we pay employee and employer's contributions. 4b. Are your employees entitled to paid leave? If so, how many days each year? If so, how many days each year? 14 days paid leave + 14 paid national holidays. 4c. Are your employees entitled to maternity leave? How many months? Is it paid? Maternity leave is 3 months that is paid out of Social Security contributions. 4f. What is the average wage (per annum), the highest wage, and the lowest wage? Highest is BZ$19,760 per annum for our facilities manager and the lowest will be an unskilled worker in the kitchen who will get an estimated BZ$7,800. Average working day at the lodge is 8 hours and the legal maximum before overtime rates apply is 9 hours. The working week is 45 hours per week after which overtime rates apply. We have a facilities manager, landscaper and gardener and assistant manager who are all employed full-time throughout the year and represent a fixed cost. Kitchen staff and housekeepers have reduced hours during the low season so their wages represent a variable cost to the lodge and they will be called in as when they are needed. 4i. Do you employ immigrants? Are they offered the same remuneration & benefits? 4j. Do you employ trainees? Please explain what type of tasks they perform, how much they are paid, how many hours do they work and how do you source them? All our staff were trainees at one point in their service. They start at BZ$0.40 above the minimum wage for the four weeks of their probationary period and then will be raised to $0.65 above the minimum wage when their employment has been confirmed. 4k. Do you use volunteers? Please explain what tasks they are given? We usually employ three work experience students for three weeks each year. We do not employ overseas volunteers and are not involved in "voluntourism" where the volunteers may be taking employment that local people could be earning an income from. 4l. Do you offer concessions to elderly visitors, students, young visitors, or nationals? We offer 50% discounts on accommodation to Belizean nationals and residents of Belize and have special rates for NGO staff. 4m. Is there infrastructure for people with special needs at your Lodge? The bathrooms in the main lodge and guest rooms can all be accessed by wheelchairs. We have used wooden ramps to push wheel chairs up the three steps to the verandahs of the rooms. There is no step from the verandah into the rooms themselves. All showers have a built-in tiled seat that allows guests to sit down while they wash.
4n. What measures are in place to protect the local (or the indigenous) population from some adverse impacts of tourism? There is still insufficient traffic for this to be an issue that needs a complicated solution. 4o. Do you undertake any poverty reduction initiatives or does your operation contribute to poverty reduction? 4p. Do you undertake any inequality reduction initiatives or does your operation contribute to inequality reduction? 4q. Do you undertake any injustice reduction initiatives or does your operation contribute to injustice reduction? 4r. What is the minimum, maximum and average age of your current employees (excluding yourself and members of the family)? 4s. How many employees do you have (excluding yourself and members of the family)? 4t. Is everyone accepted as guests or are there any restrictions? 4u. Anything else you would like to mention in this section? There is no obvious place to write about the work that my wife and I do to promote the local area as a tourism destination so here will do. For the past four years we have written and published a paper The Toledo Howler (archived copies can be found at http://www.thelodgeatbigfalls.com/the_howler.php )named after the Yucatan Black Howler Monkey that can be found here. It exists to promote the development of tourism in Toledo. It showcases destinations, activities, tour operators, transport services, accommodation, restaurants, craftspeople and other businesses directly or indirectly benefiting from visitors to Toledo. As a social service it promotes local individuals and co-operative craft groups as well as musicians. These people have no marketing budget so The Howler gives them a shop window. The paper tells stories and aims to give people a multitude of reasons to visit. We have invested many hundreds of hours in this and have produced seventeen issues so far. Photo 4u: The September 2011 edition of The Toledo Howler that includes articles on traditional healing herbs by a Garifuna healer, birds by Lee Jones the author of The Birds of Belize, a new women's craft co-operative and organic gardening initiatives among other subjects. Big Falls village is 800 metres from the lodge. Guests interact with our staff who are all from the local village. Some guests go into the village and eat at the local Belizean restaurant there. Others visit the rice mill and are given a free informal tour of that facility while others may walk into the village in the evening and have a drink in a bar. Guests also interact with the local community because we have a strong thread within our tours of visits to homes, organic cocoa farmers and musicians. We have a library and resource centre in the lodge. There we have a core collection of travel books about Belize and Central America as well as books on birds, butterflies, mammals, reptiles etc . We have manuals with pictures and information about tours, boards to record bird and animal sightings and a book exchange for guests to swap books. In the rooms we have information about the lodge, our history, a bird list, transport information, conservation information etc. Swimming, river tubing, mountain biking, table tennis, badminton, petanque, horse shoes, nature trails, guided bird walks, guided butterfly walks, guide night walks, library and resource centre. Our tours focus on nature, culture and adventure. We have natural history tours to Monkey river where guests can see crocodiles, monkeys, turtles and many species of birds as well as specific bird watching tours with our expert local guide. Adventure tours include cave swimming at Blue Creek,river kayaking, jungle hiking, snorkelling, manatee watching and swimming on the cayes. Cultural tours include visits to Florencio Mes a Mayan harpist and instrument maker, to Miguel choco an organic cocoa farmer and home visits to two women's craft and food co-operatives and to a medicinal herb plantation tended by traditional Mayan healers. Some recent events organized for local organizations and charities at heavily reduced pricing have included the following June 2011 Barbeque and pool party for the teachers of the Toledo Community College; June 2008 workshop for The Association of Protected Area Management Organizations (APAMO); Nov 2007 Workshop for The Sarstoon and Temash Institute of Indigenous Management a conservation NGO; May 2010 Retreat for Jesuit Volunteer Corps; June 2009 Punta Gorda Town Council, Strategic Planning Session. 5i. Is the local community at all involved in the operation of the Lodge and how? 5j. Anything else you would like to mention in this section? Photo: 5j1: Group of Garfiuna drummers perform for guests on New Year's Eve. There is a strong Garifuna culture in villages along the coast of Belize. The interest of tourists in their music reinforces an already strong and dynamic community culture. Photo 5j2: Guests interact with Florencio Mes a Mayan harp player and instrument maker. He has represented Belize at World Music Events. The Mayan musical traditions are under some threat especially from some missionary sects that condemn music. Payments from visits help support the household. Photo 5j3: Our guide (second right) and guests visit the home and garden of Miguel Choco an organic farmer. He sells his cocoa beans to the Growers Association that has a Fairtrade agreement with Green & Blacks in the UK makers of Mayan gold organic orange flavoured chocolate. This is a valuable cash crop and vital for family income and the paid education of children from high school onwards. I hereby declare that all my answers are true and accurate to the best of my knowledge and understand that I and/or my company will not have the right to veto or 'hide' our ECOCLUB.com Rating, which will be decided in the manner specified at http://ecoclub.com/ecotourism/rating if we find it unfavourable. I also understand that this rating application is valid for a maximum of 3 Years and a minimum of 1 Year. I may request a new rating application only after 1 Year from the day that my previous rating application was published online. By submitting this questionnaire I indicate acceptance of all ECOCLUB.com Rating terms, conditions and procedures as stated at http://ecoclub.com/ecotourism/rating, and understand that these may be modified at any time without notice.